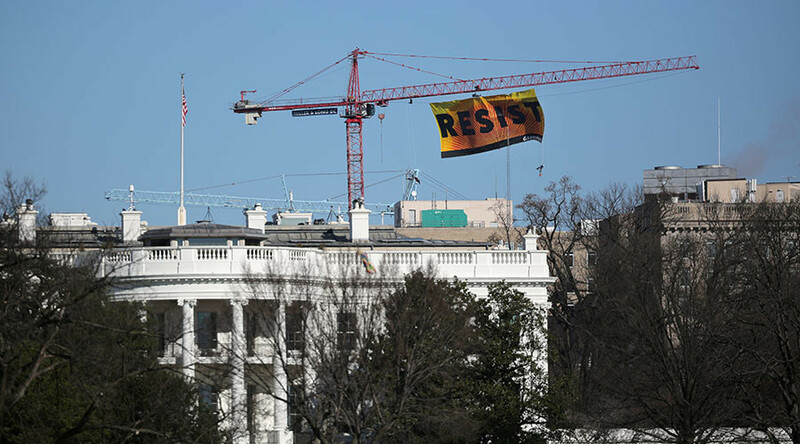 A group of at least seven protesters, apparently with Greenpeace, are scaling a crane in downtown Washington DC in protest at US President Donald Trump. DC police originally responded to a call reporting a disorderly person, only to find the activists scaling a construction crane near the old Washington Post building. Armed with climbing equipment and safety harnesses, the protesters unfurled a 35ft by 75ft banner reading “Resist,” 270ft above the ground. The protesters are preventing workers from entering the building site, while police have sealed off 15th Street between L and M Streets NW and L Street between L and M Streets NW. Robert Glover of the Metropolitan Police Department told reporters on Wednesday morning that the protesters are thought to be linked to Greenpeace. They allegedly told officers that they were exercising their First Amendment right to free speech by expressing their grievances over the new environmental policies enacted by President Donald Trump, specifically his go-ahead for the construction of the Keystone XL and Dakota Access oil pipelines. No injuries or arrests have been reported and the authorities have not yet made an effort to remove the activists, although a rescue team of firefighters has been put on standby.